First off...I wanted to send out a BIG shout out to Michelle D. a parcel full of stamping goodies for me was mistakenly mailed to her, and she called me to make sure it got to me. I so appreciate her honesty and kindness. And it was fun meeting her in person. So thanks Michelle! You were a total blessing today to me! There are days when I just feel such joy in this craft. It means a lot to me to being able to create something that is perfect for someone, with my own hands and have it demonstrate my love for them. I couldn't wait to show you this card. I have a friend at work that has had a difficult year. Her sister whom she was very close to, had a stroke more than a year ago and languished, held on for over a year. She passed away just a few weeks ago. It was not easy to watch her die, and my friend at times questioned, "Why God?" "Why does she need to suffer, why are you waiting so long to take her home?" The answers aren't always easy to see or understand, and that's where Faith really has to anchor you. This side of eternity I don't know the why. But I found a promise (and this stamp!) that I'd like to share with her that I think is such an encouragement. Because I know God to be a healer ...and I know He'll bring hope and healing to her. The verse from Isaiah reads "Give unto them beauty for ashes, the oil of joy for mourning, a garment of praise for the spirit of heaviness". I just LOVE this verse. We will mourn in life, it will be hard, and heavy sometimes, BUT the amazing power of God is that he CAN bring beauty, joy, praise and healing even in those situations. And it's so powerful when He does that. I've experienced it first hand. I've stamped this beautiful frame from Verve, Framed Wishes in Mellow Moss, as well as the Plain Jane Isaiah 61:3 inside the frame in Memento Tuxedo Black, then I was able to accent the JOY word with a copic marker. I've used the gorgeous Basic Grey Capella papers that I've barely put a dent into, but this was the perfect card for them. 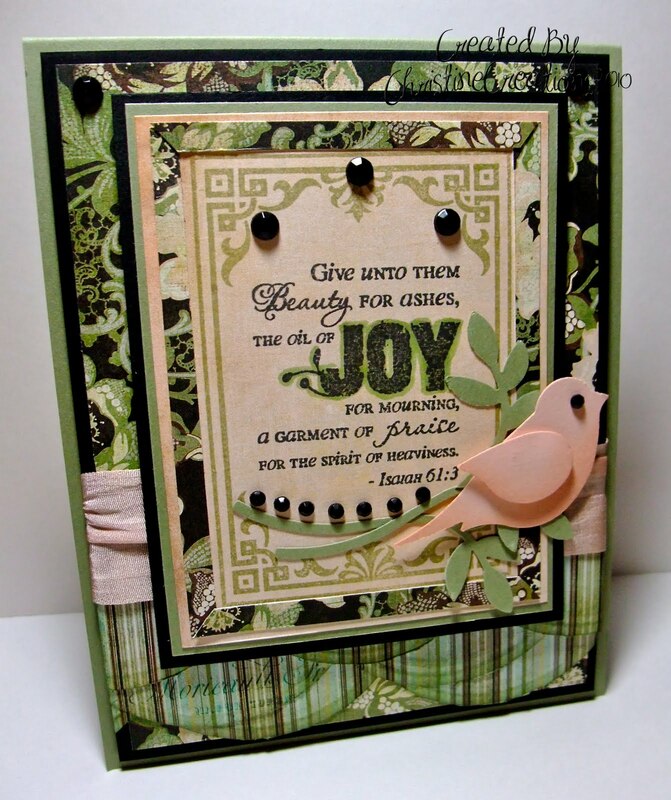 I've sponged the bottom scallops, added some gathered silk ribbon and then the sponged bird and branches punch from SU fits so well with the card, especially with the black rhinestone accents. You can see I've also added tiny strips of dp inside the frame with mitred corners to really show it off. Have a wonderful Tuesday friends. Thanks for visiting. 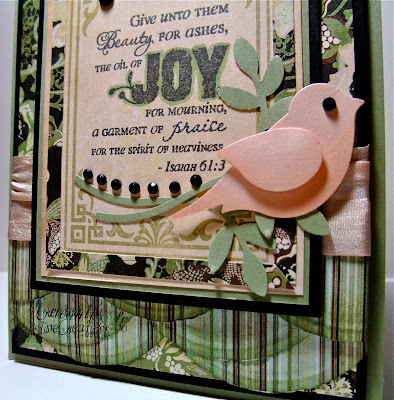 Recipe: Stamps: Verve - Framed Wishes, Plain Jane Isaiah 61:3; Ink: Memento Tuxedo Black, Mellow Moss, Blush Blossom; Paper: Mellow Moss, Basic Black, Basic Grey Capella dsp, Blush Blossom; Accessories: Copic Marker G21, Champagne Silk Ribbon, EK Success Scallop Punch, Bird and Branches Jumbo Punch (SU), Black Rhinestones, Dimensionals, Sponge. It is always hard to lose someone close that we care about. Your card is a beautiful inspiration for us all. Thank you. What a wonderful card! The verse is near and dear to my heart! Your friend will be so pleased to receive this. This is a lovely card that I am sure will be so appreciated. Those plain Janes are great, I really need to use mine more. Gorgeous Christine, LOVE LVOE those papers! Christine, This is absolutely beautiful. What a perfect verse. I know that it will bring comfort to your friend. Thank you for sharing. gorgeous, Christine! Those colours are absolutely lovely together! It was such a pleasure meeting you Christine. I only wish I could have talked to you more, but I just started this job and wasn't sure if my boss would have thought of me doing that. Meeting you in person truly made my day, for you are my inspiration for every card I make. I tell everyone who you are and when they go to your blog they can see why I'm so in love with your "art". I look forward to more of your creations. Take care Christine. Michelle D.
A perfect verse, Christine. Lovely card and I"m sure she will treasure it and be encouraged by it. Very lovely. I am sure your friend will love the card and appreciate your caring. Christine, what a beautiful card. The verse is so beautiful and I am sure your friend will take comfort in the words and your thoughtfulness. Beautifully said and beautifully made! This is gorgeous and the verse is one of my very favorites also, Christine! I hope it ministers to your friend's deepest need. This is beautiful, Christine. I'm so sorry for your friend. She's lucky to have you. I'm sure she'll treasure your card as much as your friendship. Wow this is so beautiful.. I know that it will bring her so much comfort at this difficult time.. Gorgeous work Christine.. I love the Verve Plain Janes but I don't have this one yet, or the frame. 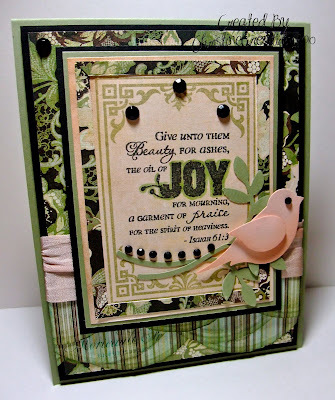 LOVE what you've done with it, adding the "mat" of patterned paper. 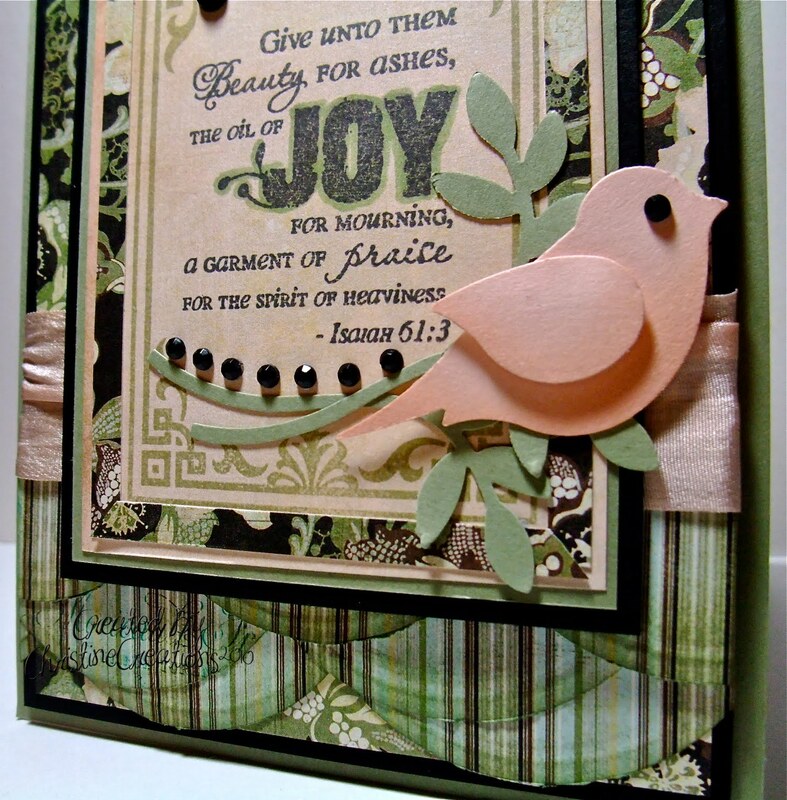 All the details are so lovely, and the rhinestones following the line of the branch are a great finishing touch. The layered scallops the bottom add a lot of interest as well. WONDERFUL and one of my favorite verses for sympathy cards.